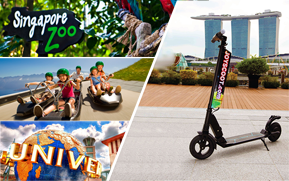 Attractions in Singapore in partnership with JoyScoot Scooter Rental provide you unique opportunity to rent scooters in Singapore for FREE! 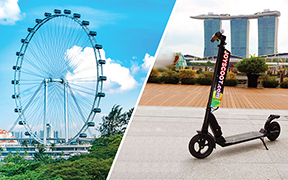 Enjoy 1 free hour of scooter rental with each 3 tickets to Singapore attractions purchased on our website. Enjoy your FREE scooter ride along Marina Bay in package with other Singapore attractions. Get more Free hours by purchasing more tickets. Buy at least 2 different attractions and get scooter rental for only S$10/h. Click here to avail this promo. Singapore Flyer and e-scooter rental bundled packages. Where can you ride your FREE scooter? 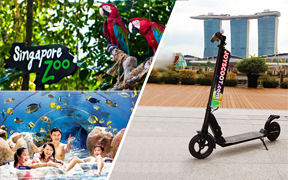 Joyscoot Kiosk is located at Singapore Flyer adjacent to Marina Bay, which is covered with wide shared paths and is by far the best area to ride on personal mobility devices. See the map here. How do we send you the tickets to selected attractions? Electronic tickets will be forwarded to your e-mail upon making purchase. Just follow the instructions to claim them at the attractions that you select in Singapore. We have partnered with following attractions in Singapore to deliver value for money for your holidays and leisure time.